Just Romantic Suspense: What Makes a Compelling Villain? What Makes a Compelling Villain? 1. The Right Time to Reveal – Renaud is the one pulling the strings in Single Malt (AIW1), but he does so through henchmen and lackeys. Renaud also makes an attempt on Aidan’s life at the beginning of Cask Strength (AIW2), but we still don’t see him. It’s not until Barrel Proof, when our heroes have chased him for months, that Renaud finally appears on page. By delaying the reveal, Renaud’s shadowy persona grows, along with Aidan’s and Jamie’s—and the readers’—fear and anticipation. And for a villain who’s played the chess match so well, it makes sense he doesn’t show himself until the final move. This is not to say the villain’s appearance should always come late. It depends on the narrative and genre. For example, in thrillers we usually meet the villain early. The point is, always ask the question. 2. Know the OTT Line – Dr. Evil is over the top and on point for Austin Powers. He would not be on point for Agents Irish and Whiskey. The OTT line varies by narrative and must be considered. If a villain goes past the OTT line, it’s difficult to take the villain (and hero’s pursuit) seriously. Renaud works in AIW because he is a refined, master chess-player, a perfect foil for the Bureau’s best crime solver and best hacker. He does have a slight larger than life flair, but then so do all the AIW characters. 3. Motive/Relation to the Hero – Most importantly, a compelling villain’s motive will be human/real and directly related to the hero. Personally, I find the most compelling villain to be a worst-case reflection of the hero. As revealed in Barrel Proof, Renaud is out for revenge after losing his wife. It’s a very human motive, and a parallel to Aidan. When Aidan lost his husband, he could have turned away from love, like Renaud, and solely focused on revenge. But neither his family nor Jamie would let him; that’s what separates him from Renaud, what separates the hero from the villain. With those rules in mind, Renaud comes to life (and death) in the Agents Irish and Whiskey series, and in so doing, he brings our two heroes, Irish and Whiskey, together. Who are some of your favorite compelling villains? 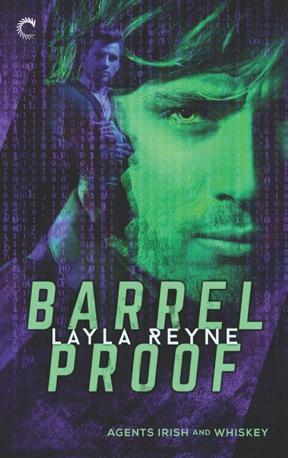 Layla Reyne finishes her trilogy with an absolute bang! As sorry as I am to say goodbye to this fabulous pair I couldn't have enjoyed their ending more.